The 2013 Six Grasswren tour covered over 3,000 km mostly on outback roads. From Adelaide (SA) we travelled through Gluepot, Broken Hill and Tibooburra to the ‘Corner Country’. From there, the Strezelecki track was followed south, and after a detour via Whyalla we travelled through the Flinders Ranges and back to Adelaide. The weather was quite reasonable with only one hot day. In total 168 bird species were seen. 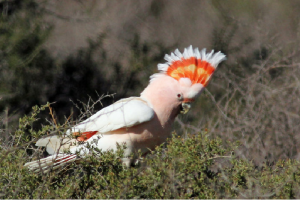 Apart from the Grasswrens, highlights included Flock Bronzewing, Letter-winged Kite, Australian Bustard, Inland Dotterel, Major Mitchell’s Cockatoo, Budgerigar, Banded Whiteface, Black Honeyeater and Yellow-footed Rock-wallaby.